Virginia is an accomplished healthcare innovator, with leadership roles in medical device, pharma and nutrition businesses. Currently, she heads the Global Strategic R&D organization at Abbott Nutrition, responsible for acceleration of innovation through early-stage research and global partnerships. At Abbott Vascular, she led development of ABSORB, a bioabsorbable vascular scaffold, which received the Wall Street Journal 2011 Medical Device Innovation Award. She has had a number of IP strategy roles, including with J&J. 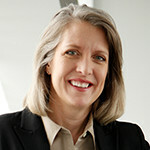 She serves on the Executive Committee for the Center for Nutrition, Learning, and Memory at the University of Illinois, the Cornell Engineering Council, the Georgia Tech/Emory Biomedical Engineering Ad Board, and the President’s Council of Cornell Women. She is a co-founder of MedtechWomen. She received BS and MEng degrees in Mechanical Engineering from Cornell University and PhD in Biomechanical Engineering from Stanford.